Located in the city center, Mandala, the Hotel is a luxurious hotel in Berlin. The hotel is present in an area that borders the city’s bustling Potsdamer Platz. 158 well-equipped rooms are what this hotel features. To keep you entertained, the hotel makes available high-speed DSL in the room. Facing the inner courtyard of the hotel, the rooms are professionally designed. A unique feature of this hotel is its 2- star restaurant that gives guests access to spectacular city views. The retractable gloss roof of the restaurant makes this possible. Also, free Wi-Fi is available throughout the hotel and you can have a relaxing time at the full-service spa. The spa features a fitness lounge, relaxation areas, and sauna. For snack and drinks, there is an onsite bar present on a terrace. For travelers and explorers, there are many to visit nearby. 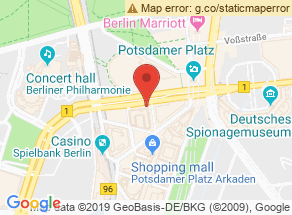 Some of the places near the hotel you can visit include Legoland Discovery Centre Berlin, Natural History Museum, Berlin TV Tower, and Potsdamer Platz. A unique experience awaits you at Mandala, the Hotel. Great location, close to the train station. Central location with great sightseeing, dining out and shopping. Accessibility by car can be a challenge. Service is professional and friendly. Reception, housekeeping and restaurant service were adequate. Room service is perfect. Peaceful, comfortable and spacious rooms with large bathrooms. AC needs updating. New, clean rooms with great minibars. Great balconies and views from spacious, decently kept up rooms. Large, so-so bathroom. Rooms have average kitchenettes and furniture. A/C and TV are subpar. Shower can be a problem.